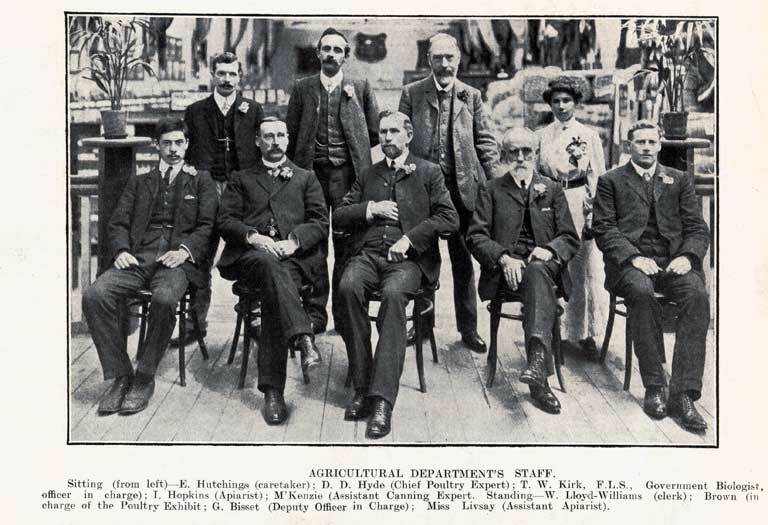 Caption: Agricultural Department’s staff. Sitting (from left) - E. Hutchings (caretaker) ; D. D. Hyde (Chief Poultry Expert) ; T. W. Kirk, F.L.S., Government Biologist, officer in charge); I. Hopkins (Apiarist) ; M’Kenzie (Assistant Canning Expert. Standing - W. Lloyd-Williams (clerk) ; Brown (in charge of the Poultry Exhibit ; G. Bisset (Deputy Officer in Charge) ; Miss Livsay (Assistant Apiarist). Description: The Government Agricultural Court. Source: Canterbury Times, 6 Feb. 1907, p.41.